KANSAS CITY, Mo. 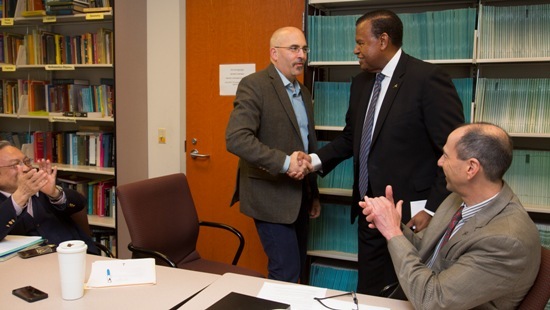 – On behalf of the University of Missouri System, University of Missouri-Kansas City Chancellor Leo Morton today awarded the final of eight UM System President’s Awards to be presented to faculty in 2016 to Daniel H. McIntosh, associate professor of physics and astronomy at UMKC. Morton surprised McIntosh with the President’s Award for Innovative Teaching in front of colleagues gathered for faculty meeting. The award, which includes a $5,000 prize, recognizes outstanding faculty who employ novel and innovative teaching methods to achieve success in student learning. McIntosh joined the UMKC faculty in 2008 and has since been the recipient of six teaching award nominations and the 2014 UMKC College of Arts and Sciences Alumni Outstanding Teaching Award. McIntosh prides himself on engaging his students in physics concepts by facilitating active learning in the classroom. As a part of his course offerings, he began an introductory astronomy sequence that is unique in the nation as it discards the traditional facts-heavy organization and, instead, uses two independent, concepts-heavy courses that reinforce a deeper understanding of physics. In 2010, McIntosh founded Astro Hour, a weekly discussion forum open to all students, to promote diversity, open dialogue and scientific literacy. In 2012, he created ‘A Bridge to the Stars Scholars and Mentors’ program, providing scholarships for under-represented and minority students to enroll in his introductory astronomy courses. The following year, he founded a sustainable training course in which students complete a set of experiential tutorials to advance their skills in producing high-level science products. In addition to excellence in teaching, McIntosh has co-authored more than 85 publications appearing in leading scientific journals and has secured six grants totaling $386,000 to develop UMKC’s burgeoning astronomy program. His commitment to innovative instruction and programmatic success has helped transform the Department of Physics into today’s Department of Physics and Astronomy. The UM System President’s Awards are presented annually to faculty members across the four campuses of the UM System who have made exceptional contributions in advancing the mission of the university. McIntosh will be formally recognized by UM System Interim President Michael Middleton during an awards celebration to be held in June.